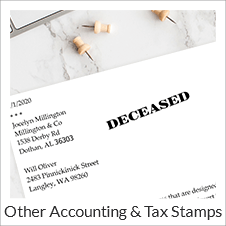 At Simply Stamps you can find quality accounting and tax related stamps that are essential to accountants and tax professionals. 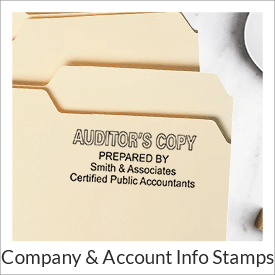 Are your clients facing an IRS audit? Is the process of filing and compiling your payroll or general office paperwork time consuming? Our line of office stamps is sure to speed things up. 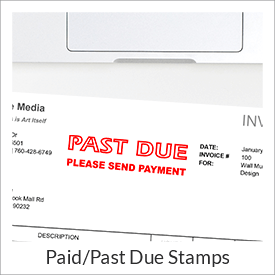 Save time with a PAST DUE stamp for Custom Line Deposit Only Stamp. 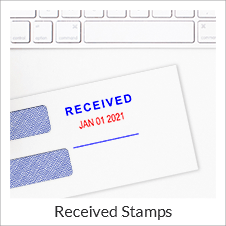 We've worked with our own accounting department to make sure these stamps are useful in completing your own office's task list. Need other office stamps? 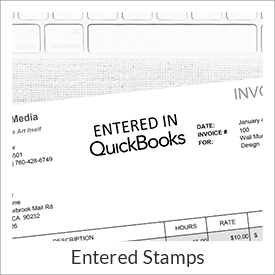 Our line of stock office stamps is available to further aid the efficiency of your own business. When you work in a busy accounting department, it is imperative to accurately and quickly get through paperwork. Find important templates like past due, insufficient funds, approved, accountant's copy, auditor's copy, final copy and more. 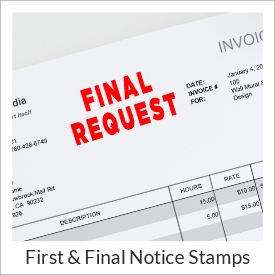 Order your own accounting rubber stamps today and we will ship your order next business day, from Simply Stamps!